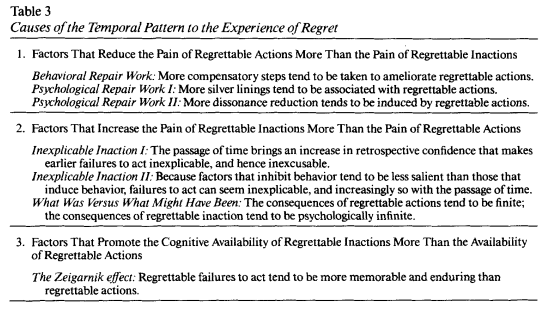 Is it true that individuals often regret recent actions (i.e., last few months) but when they look back on their lives, they tend to regret things that they have not done (or lack of actions) ? If so, what causes this? For a more complete description of these factors and a discussion of the relevant evidence, see the link I posted above to the Gilovich & Medvec paper. Not the answer you're looking for? Browse other questions tagged social-psychology developmental-psychology emotion decision-making well-being or ask your own question. What is the fear/paralysis that occurs before doing an irreversible action?